Following the release of iOS 11.3 and watchOS 4.3, Apple on Friday began rolling out transit card integration in China, offering iPhone and Apple Watch users in Beijing and Shanghai tap-to-ride public transportation access. Apple Pay's new support for the Beijing Transportation Smart Card and Shanghai Public Transportation Card was previously teased in an iOS 11.3 beta this month. Integration has yet to be recognized on Apple's regional Apple Pay website, which still lists transit as a beta feature. Despite word of official support, users in the area are successfully provisioning cards in the Wallet app on iOS, reports Wei Feng. Japanese language blog Ata Distance points to a number of Twitter posts verifying an activation of services. As noted by Apple, the Beijing Transportation Smart Card provides gate access to local subway and bus lines. While not confirmed, Wei Feng suggests card holders can also use Apple Pay to board buses and trains in cities that support the national China T-Union card. 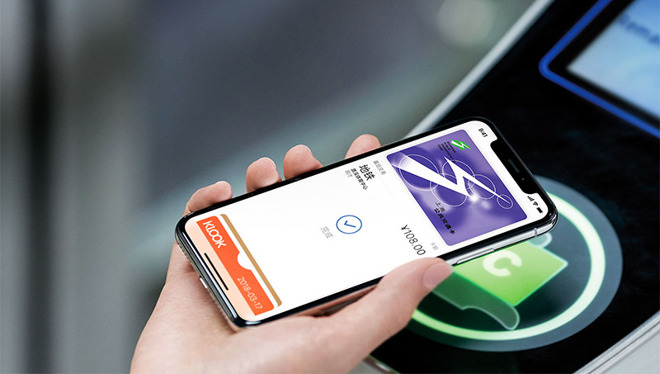 With the Shanghai Public Transportation Card, Apple Pay's NFC capabilities can be used to access subway, bus, ferry and Maglev routes in that city. Unlike Japan's Suica integration, users in China can provision a Beijing Transportation Smart Card or Shanghai Public Transportation Card directly from the Wallet app, according to an Apple support document published today. Apple Watch owners must add cards to their wearable via the Watch app on iPhone. Riders can switch off between physical and digital cards, suggesting the system syncs balances with a central server. Further, the balance of an existing physical card can be transferred to Apple Pay through the recharge mechanism in Wallet. Apple's new Chinese transit card support is available on iPhone SE, iPhone 6, iPhone 6s, iPhone 7, iPhone 8 and iPhone X, as well as Apple Watch Series 1 models and above. Apple on its dedicated Apple Pay webpage notes the service can be used to pay for metro fares in Guangzhou and Hangzhou, though NFC-based gate and turnstile access is not available in those cities. This option is similar to in-app fare purchasing features rolled out in New York with the MTA eTix app. Apple is looking to build out transit card compatibility in a bid to make Apple Pay a more valuable tool for urban dwellers. Last year, the company took steps toward that goal by incorporating global FeliCa technology into its mobile devices, paving the way for expansion into Asian countries. Most recently, Singapore last year announced plans to extend a trial program that allows bus and train passengers to purchase tickets via contactless payment systems including Apple Pay.